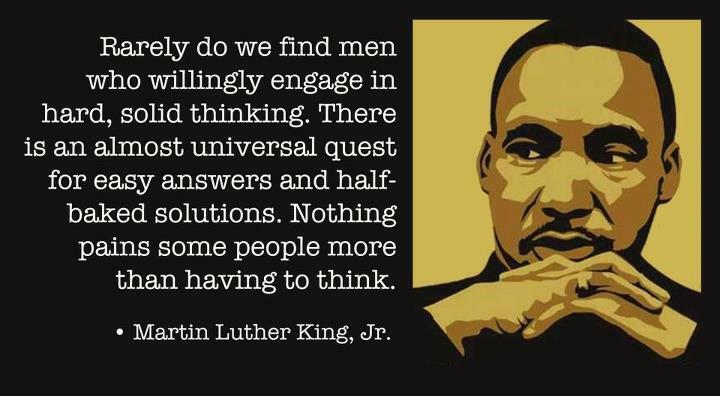 Contemplative Martin Luther King Jr. Day! Today in the U.S. is Martin Luther King Jr. Day. A holiday in celebration of the life of one person who was bold enough to challenge the established order and say, “hey, uh, excuse me, would you mind treating everyone like human beings?” I’m paraphrasing. You may have heard his famous speech, “I have a dream that people won’t be complete assholes to one another.” Again, I paraphrase. He was rewarded for his efforts with a bullet in his head. So, after much resistance from racists and people who don’t know they’re racist but still make ignorantly racist statements like, “how come there’s not a White History Month,” we have set aside this day to celebrate Rev. King for having the temerity to hope people could live in harmony. To him and the people who believe in his message, I say, Happy Martin Luther King Jr. Day! No, wait, “happy” doesn’t seem like the right adjective. It doesn’t seem like a day set aside for a guy promoting racial equality should be considered “happy.” Especially when his work isn’t done, his dream is only partially manifest. “But we have a black president, racism is over,” says the person who apparently never been online or doesn’t understand that the black experience in the U.S. is drastically different from the white due to institutionalized racism. Maybe, Reflective Martin Luther King Jr. Day! No, that doesn’t have the same ring to it. I need an adjective that flows off the tongue but has the same impact. Revolutionary Martin Luther King Jr. Day! No, too strong. That’s too much expectation on one day. Maybe just be aware, Awareness Martin…No, that’s definitely not right, but maybe a word similar to awareness that connotes a similar feeling of just recognizing that Rev. King’s work isn’t done. Mindful Martin Luther King Jr. Day! That’s pretty good, but I’d have to drop the exclamation point. No one has ended a sentence with “mindful” in it with an exclamation point. How about: “Have a soul-searching MLKJr Day”? Oh, I like it. Good thing you weren’t around to give suggestions earlier or I may not have had anything to write. A great human being, for sure. I was looking at a poll this morning that shows that – for the first time in a couple decades – more white people believe race relations are bad in this country than believe race relations are good. That’s right: Two years ago, 75% of whits were thinking everything was fine! Then last summer came and now things are all messed up. Part of me believes that the mere fact that white people can see that there’s a problem right now might be progress. Have a socially acceptable MLK Day full of awareness and reflection and tolerance! …That was so PC it almost hurt. I like mindful. It’s a word I’ve never used before, but perhaps I’ll start today. My friend Carol, who is 74 and black, and I, 25 and white, think it’s wrong to have a black history month because black history should be taught all the time along with all the other history. So, until we can collectively say, “why do we need this, we learned about Frederick Douglass back in November?” then we need Black History Month. Janie is so right. black history should be taught in school all the time. We should always keep in mind the things that history has taught us. 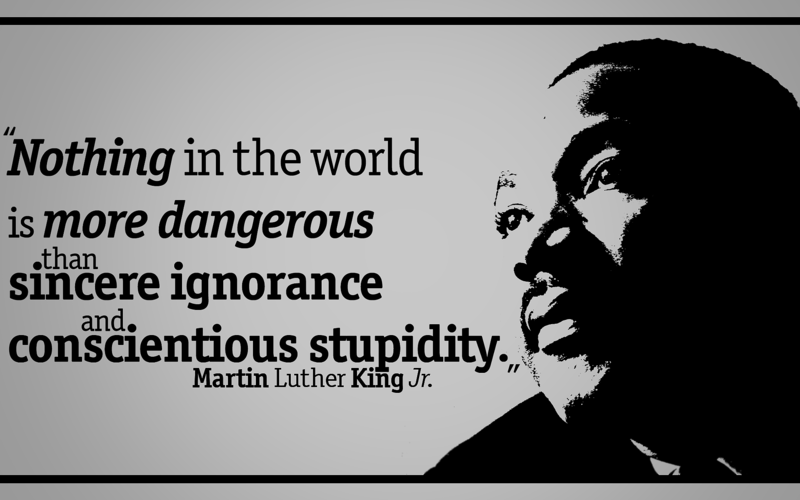 MLK-Day, is one of many days that we should think hard on for all the stupid mistakes that have happened in America. Yep, and Janie’s comment made me sad because we still do need a Black History Month because there are teachers, history books, and standardized tests who/which will only teach the language of the dominant. Don’t ever say tru dat again, or I’ll send you back to nerd school. Was he famous before he became an activist? I figure people don’t just listen to a guy on the street, even if he’s got something good to say. He was a preacher so he knew how to draw a crowd and make a compelling speech. He wasn’t famous as a kid and very young man, but his fame grew quickly and it didn’t take long for him to become well known. He won the Nobel Peace Prize. His Nobel Peace Prize speech (http://www.nobelprize.org/nobel_prizes/peace/laureates/1964/king-acceptance_en.html) is depressingly prescient, and amazingly profound. If you’re looking for an example of why he is revered, please read that speech. You’re right, that was beautiful. Temerity is a great word, Pickleope. I don’t know what it means, but I like it. I like your sentiment too. We would all do well to examine our bigotry.